Apply an activity series to predict products and write net ionic reactions that identify spectator ions in a single-replacement reaction. Use a solubility chart to predict products and write net ionic reactions that identify spectator ions in a double-replacement reaction. Identify the oxidation states of ions in an oxidation-reduction reaction. Balance an oxidation-reduction reaction performed in neutral, acidic, or basic environments. Use reduction potentials to determine the anode and cathode reactions in an electrochemical cell, and calculate its standard reduction potential. Apply reduction potentials to identify oxidizing and reducing agents and determine their relative strengths. Calculate the number of moles, mass, number of ions, atoms, and molecules, volume, and pressure of reactants and products in a chemical reaction based on appropriate constants and quantitative information about reaction components. Calculate the amount of remaining reactants and products in which one of the reactants is limiting. Calculate the rate of a chemical reaction based on elapsed time and amount of remaining reactant or product. Use the rate law and rate of reaction to calculate and interpret the rate constant of a chemical reaction. Calculate and interpret the reaction order based on the rate constant and concentration of reactants or products at various times during the reaction. Draw energy profiles for catalyzed and uncatalyzed chemical reactions in terms of activation energy. Write an equilibrium expression and calculate the equilibrium constant based on the concentration of reactants and products at equilibrium. Interpret the magnitude of the equilibrium constant to determine equilibrium concentrations and direction of a chemical reaction that has yet to reach equilibrium. Apply Le Chatelier�s Principle to predict shifts in the direction of a chemical reaction in response to changes in temperature, pressure and concentration of reactants or products. Calculate the percent ionization and pH of a solution given the identity, concentration, and acid/base dissociation constant of an acid or base. Prepare a buffer of a specific pH and calculate the change in pH in response to addition of additional acid or base. Perform a titration of a weak acid or weak base identifying the Ka or Kb and the pH at the equivalence point. 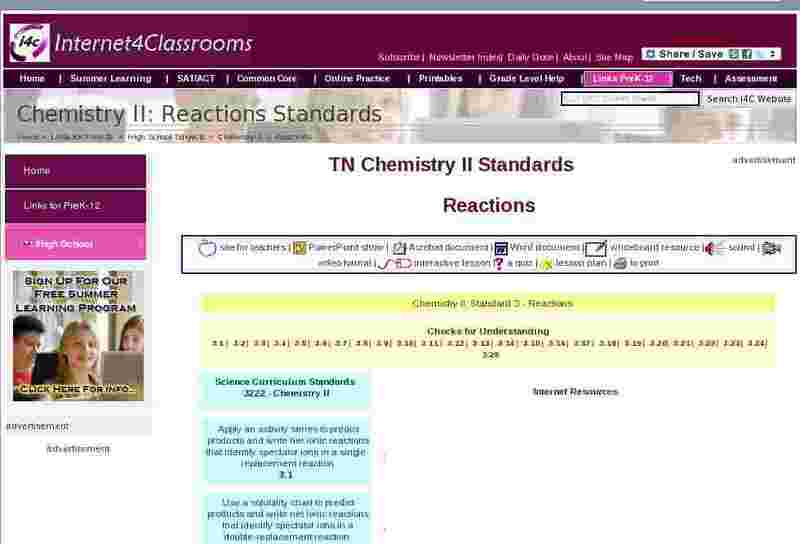 Characterize the strength of acids and bases by exploring their chemical structures. Calculate the solubility product constant based on the concentration of soluble ions. Interpret the magnitude of the solubility product constant in terms of the solubility of the substance. Apply thermodynamic data to calculate the change in enthalpy, entropy, and Gibb�s free energy of a chemical reaction. Interpret the magnitude of the enthalpy and entropy change of a chemical reaction in terms of heat changes and order of the reaction components. Interpret the magnitude of free energy hange in terms of spontaneity of the chemical reaction. Relate the magnitude of the free energy change to the equilibrium condition and reduction potential of a chemical reaction.